Collaborations, tie-ups and ambassadors are dime a dozen in watchmaking, and Hublot is an especially egregious offender. It just announced the Hublot King Power Red Devil, the second watch Hublot Manchester United watch after the Big Bang Red Devil. 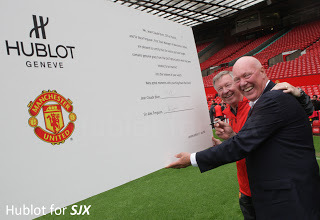 Hublot signed its sponsorship agreement with Manchester United in 2008, and it also has tie-ups with a plethora of other sporting organisations and celebrities. There is a method to the madness. 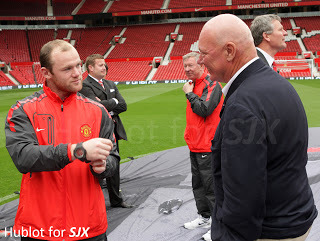 As Jean-Claude Biver, Hublot’s irrepressible CEO, explains it, soccer is watched by everyone everywhere. Rich and poor, young and old, football transcends boundaries. Rich people buy football clubs while millions of youths in developing countries watch soccer. Consequently you can reach an enormous audience at all ends of the spectrum in partnership with Manchester United, an incredibly powerful brand and possibly the world’s most famous football club. 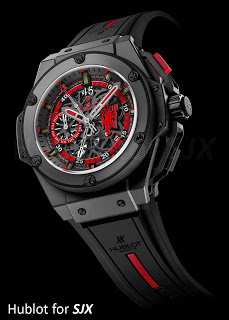 So when Hublot entered China, it did so with Man U when the club went on its Asian tour. Interestingly, JC Biver notes prior to Hublot and its Man U partnership, football sponsors were typically low to mid priced consumer goods or service, Coke, AIG and the like. Man U benefits from the partnership from its association with a luxury goods. This contrasts with the collaborations of other high-end watch companies, which often partner little known or niche individuals or organisations. The charitable explanation of that is that these watch companies want to appeal to a particular audience, but it might also be simple cost minimisation.